I learned two things this October… but did I internalize the lessons? Oh no, I let them slide. It’s time to revisit those lessons. First, InkTober taught me how much I enjoyed fleshing out and shading a pen and ink sketch with crosshatching. I thought I didn’t have the patience to achieve volume hatching all those tiny curving lines. Don’t get me wrong, I’m nowhere near proficient but I’ve enjoyed the process way more than I thought I would. I’m going to make sure I keep practicing. Secondly, I love, love, LOVE posting with the WordPress app for my iPhone. I posted most of my InkTober sketches with the app. I look forward to using it more and more. 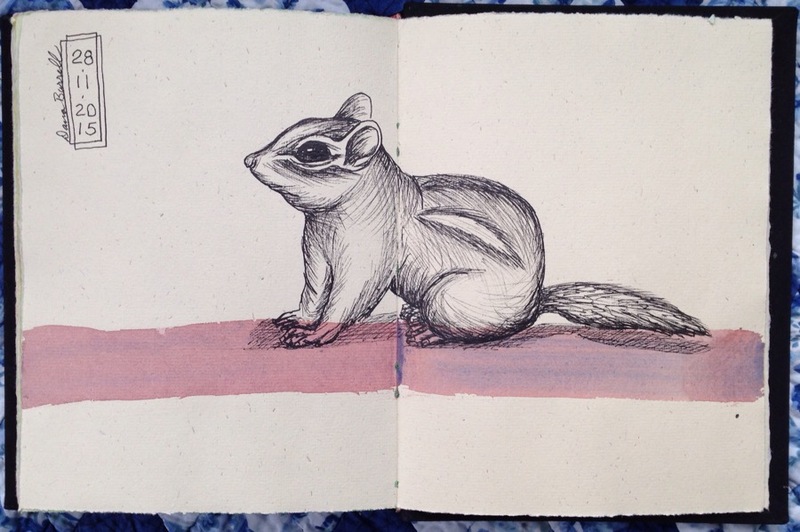 This entry was posted in Pen and Ink and tagged Chipmunk, Pen and Ink by Dana Burrell. Bookmark the permalink. Yeah, WP changed the format and made it easier for phones, I think. My sweetie loves your squirrel, cross hatches and all. Enjoy your weekend, Dana.